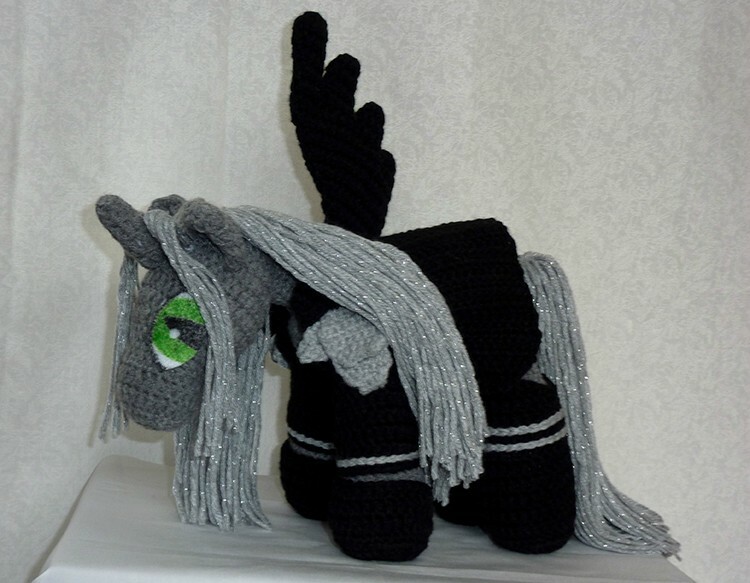 Hooked on Anime also made a Pony Sephiroth. 4.5 mm crochet hook or size needed to obtain gauge. 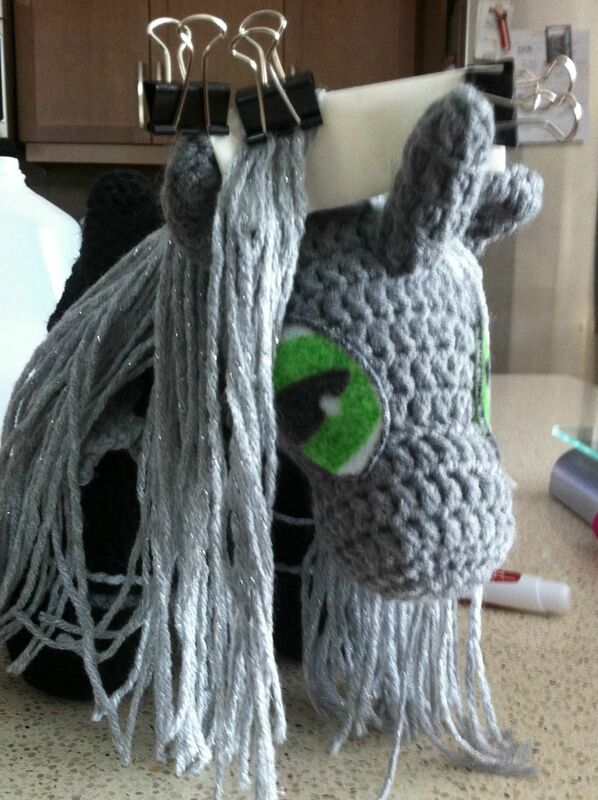 With grey, make one basic pony with a male nose and horn. With black, make one wing. The main coat is made in two parts so that it’s more symmetrical. It’s certainly possible to do it all in one piece if you choose, just attempt to mirror the way the armhole is shaped. Personally, I think it’s easiest to just stitch it up the back. Rows 2-4 create the armholes for the jacket, and rows 12-13 create the wing hole on the right half. I used short rows to create the shaping. These are marked in the pattern (SR); just sc the number of stitches indicated, chain one, and turn your work. When doing the next full row, I tried to minimize the jog at the end of the short row by working into the side of the last short row stitch, rather than the top of it. There will be a bit of a lump, but just make sure it pokes towards the wrong side of the fabric and it will look fine. For row 3b, if you don’t like doing the dc 2 tog, dc 1 in same st as prev., just don’t decrease or increase and dc 2. I’m not entirely sure it worked the way I wanted it to anyway, so it doesn’t really matter. Refer to Cid’s Jacket for pictures of how the arm and wing holes work. With black, chain 21 (1 to turn). The sleeves are crocheted directly into the armhole gaps in the jacket body. It doesn’t really matter where you begin picking up the stitches, just as long as you split up the half-double and single crochets so that the taller stitches are on what will be the outer part of the arm. With light grey, crab stitch around the bottom of the sleeve, just above the sc round. With black and the right side of the main coat facing you, insert your hook in the rightmost peak of the neck edge (approximately row 11 where the first dc 3 tog was). Pick up and sc approximately 26 sts evenly to the opposite peak. (How many sts you pick up depends on how tightly you crochet. It doesn’t really matter as long as it’s evenly distributed and you’ll get a smooth collar without any bunching or rippling.) Turn. Finish. 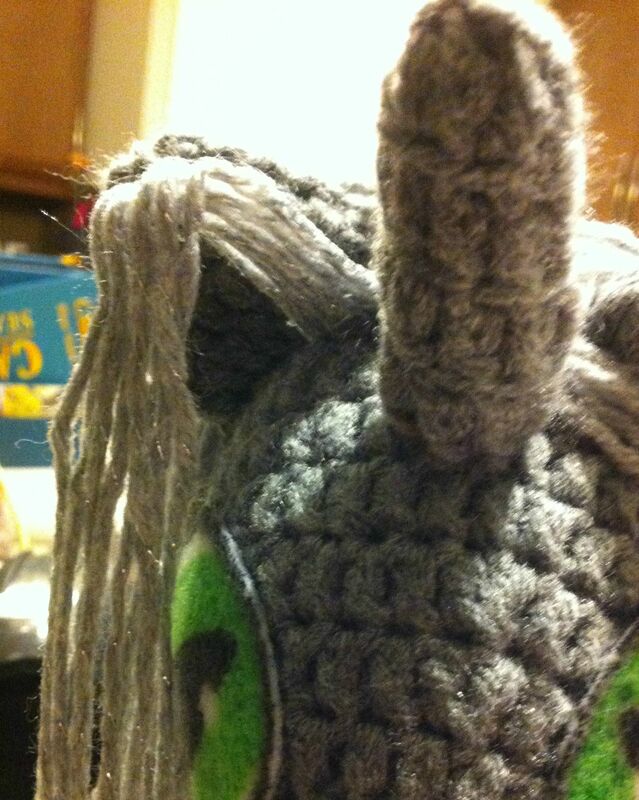 You can sew down the edges of the collar to make them stay down a bit better with the tail ends of the yarn. 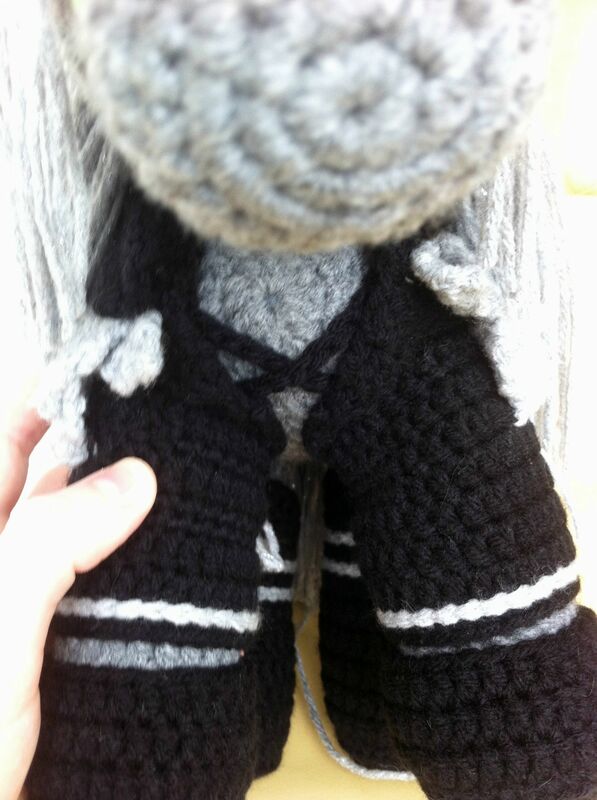 Once the coat is on, with black, attach your yarn on the inside of the coat near the bottom of the chest (see picture). Chain to an appropriate length so it crosses over his chest and up towards the collar. Cut the yarn and stitch it down to the inside of the coat. YOU WILL NOT BE ABLE TO REMOVE THE COAT AFTER THIS! That was a bit of an exaggeration. It’s theoretically possible, but not remotely easy to remove the coat. The shoulder guards are made in three pieces, then sewn onto the coat. With light grey, ch 7 (1 to turn). Row 1: With light grey, pick up and sc 6 using the skipped front loops from row 6 of the top. With light grey, ch 4 (1 to turn). Sew the wide end of the front piece onto the front edge of the top part of the guard, angling it slightly. Sew the top of the whole thing just below the collar of the coat, so that the main guard is going down over the arm and the front piece is following the edge of the neckline. I stitched the bottom down as well, leaving a bit of room so it’s not lying flat against the coat. With light grey, crab stitch around the circumference of approximately round 10 and 11 (2 separate circles). 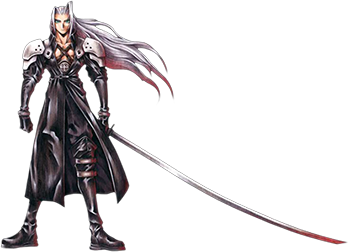 Sephiroth’s hair is super long. Make sure you iron it. I did rows of four rather than three so it would look better parted. Honestly, a smart person would really just do a fringe. Take a piece of waxed paper and fold it multiple times until it is slightly taller than the height that you want the bangs to stand at. Take the section of yarn that will be one side of the bangs (left or right side of the part) and lay it flat against the waxed paper so that the paper side is closest to the nose. Use a clip at the top to force the yarn to fold over and the paper to stay where it is. Grab the Elmer’s and go to town with the glue. You want to soak the yarn. There will be a bit of a gap between the wax paper and the head. Take the Aleen’s (because it’s a better glue) and add some more glue to the base on both sides. Wait overnight. Don’t attempt the other side while you’re waiting. Do something else entirely. Don’t poke it just to check. When the glue is dry, very carefully remove the clips and waxed paper. Repeat for the other side. With luck, you will have some lovely, gravity defying bangs.